If you are thinking of cycling The Danube then just do this section!! Basically today can be summed up in one word WOW, stunning scenery, great empty roads & morning coffee for 60p. 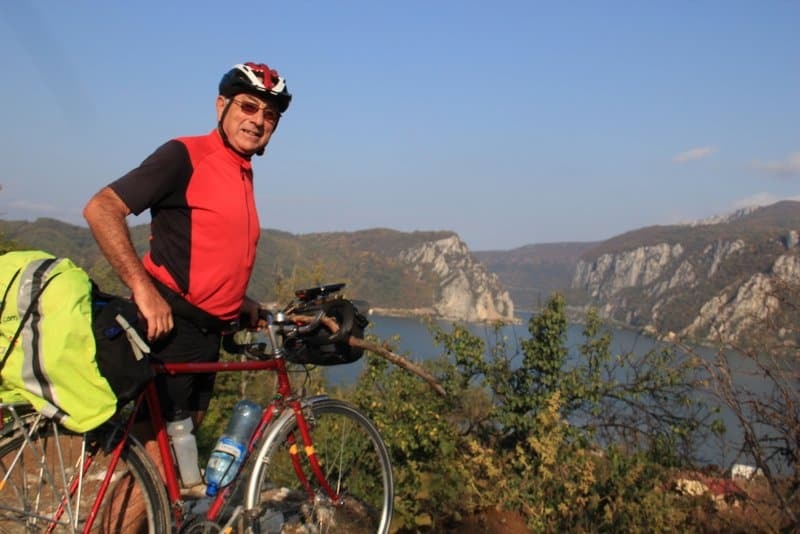 I’m so pleased at choosing to cycle on the Romanian left bank rather than the Serbian right bank which looked awful with it’s endless tunnels, viaducts etc. For anyone debating which side to bike on, it’s a no brainer there is plenty of accomodation, although non of it is listed on booking.com or tripadvisor the road is only broken up, due to landslides, in a few parts, which is good as it obviously keeps the traffic down. Also it’s mainly flat except for a couple of biggish hills, see My Strava data for where they are! Worst feature of the day was the packs of marauding dogs, usually they just barked but sometimes all you could see were white teeth 🙁 I’ve certainly learnt to sprint now, which is OK until the road surface suddenly changes to potholes 🙁 🙁 Afterwards I found a big stick which I kept lodged in my handlebars (see the pic). After 60 miles and seeing the rather nice looking Pensiunea Septembrie I decided to call it a day.